Omeprazole oral paste & granules for treatment and prevention of gastric ulcers. Sucralfate granules for treatment and prevention of hindgut ulcers. Deworming oral paste and granules for treatment and prevention of equine worms and parasites. Equine probiotic granules. Assists healing and restores intestinal microflora. Anti-inflammatory granules. Alleviate musculoskeletal inflammation and pain. AbPrazole™ (Omeprazole) for the treatment and prevention of equine gastric ulcers in easy-to-measure, easy-to-feed once-a-day dosages of flavorless, blue, enteric coated granules. Omeprazole is from the family of proton pump inhibitors (PPI's) that blocks secretion of acid and assists by reducing and neutralizing acid in the horse's stomach allowing improved healing of existing ulcer damage. AbPrazole™ (Omeprazole) 140g bulk pack - equivalent to 50 x 2.8g single sachets, for the treatment and prevention of equine gastric ulcers in easy-to-measure, easy-to-feed once-a-day dosages of flavorless, blue, enteric coated granules. AbPrazole Plus™ (Omeprazole + Probiotic) is for treatment and prevention of equine gastric ulcers in easy-to-measure, easy-to-feed once a day dosages of flavorless enteric coated blue granules containing Omeprazole plus a probiotic. The presence of a probiotic helps restore natural intestinal flora, leading to more rapid recovery and better nutrient absorption. AbPrazole Plus™ (Omeprazole + Probiotic) 210g bulk pack - equivalent to 50 x 4.2g single sachets, is for treatment and prevention of equine gastric ulcers in easy-to-measure, easy-to-feed, once a day dosages of flavorless, blue, enteric coated, granules containing Omeprazole plus a probiotic. 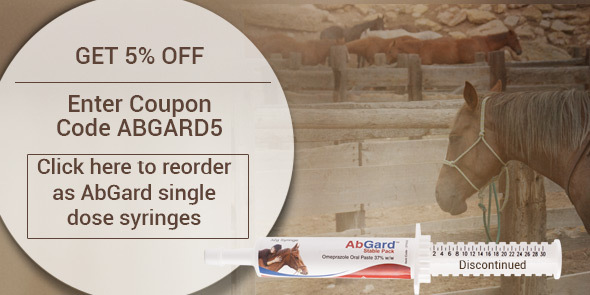 AbGard™ (Omeprazole) is for the treatment and prevention of equine gastric ulcers in a single daily dose easy-to-use oral syringe of flavourless paste. 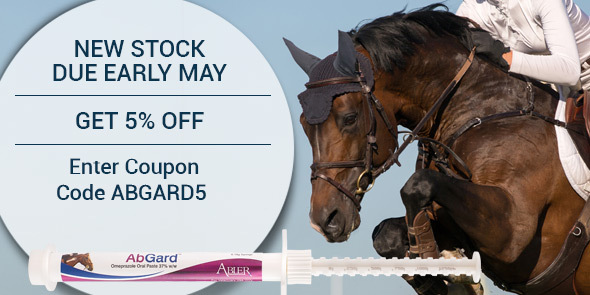 AbGard™ Stable Pack (Omeprazole) for the treatment and prevention of equine gastric ulcers in an easy-to-use, multi dose oral syringe of flavourless paste. Omeprazole is from a family of proton pump inhibitors (PPI's) that blocks secretion of acid and assists by reducing and neutralizing acid in the horse's stomach allowing improved healing of existing ulcer damage. AbPrazole™ Tablets (Omeprazole) are for the treatment and prevention of equine gastric ulcers as a once day dose of enteric coated flavourless, blue coloured, tablets. 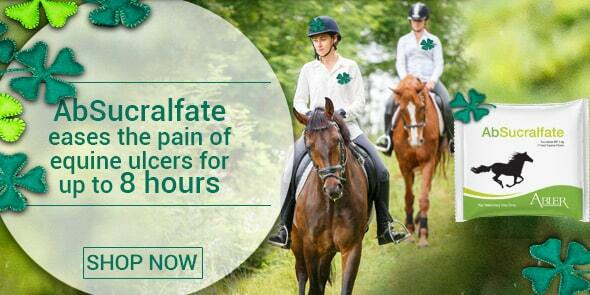 AbSucralfate™(Sucralfate), easy-to-feed, pre-measured doses of flavourless green, film coated granules of sucralfate, for the relief of symptoms of equine gastric and hindgut ulcers. Sucralfate is an aluminum salt of sucrose which is not absorbed or metabolized in the body. Sucralfate works by coating the stomach and small intestine with a protective layer. It allows the body to heal equine glandular gastric ulcer syndrome (EGGUS) and equine squameous gastric ulcer syndrome (ESGUS*) non glandular. It has also been known to be useful for treating hindgut ulcers occurring in right dorsal colitis (RDC). 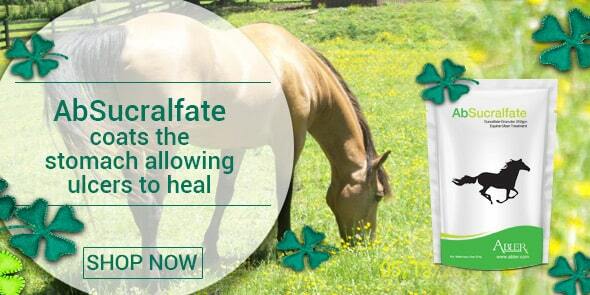 AbSucralfate can also be used as a preventative measure for horses prone to ulcers. Precautionary treatment can be used for travel, times of high stress, feed changes or with ulcers associated with use of NSAIDs. Each sachet of AbSucralfate contains 5.0g of Sucralfate. 1 sachet per 175kg (385lb) Each dose of AbSucralfate is effective for 6 to 8 hours. Your horse will experience immediate relief after being treated with sucralfate. You will see noticeable results in 3 - 7 days. For best results, treat for up to 28days and then continue with the maintenance dose. AbSucralfate™(Sucralfate), easy-to-feed, equal to 60 single sachets, pre-measured doses of flavourless green, film coated granules of sucralfate, for the relief of symptoms of equin e ulcers. AbActive™ probiotic (Probiotic B. coagulans) helps restore natural intestinal flora, leading to more rapid recovery and better nutrient absorption, easy-to-feed once a day dosages of flavorless blue, enteric coated granules. AbFen™ (Fenbendazole) is an equine dewormer formulated to treat parasites that can damage a horse’s gastro-intestinal and respiratory tracts of easy-to-measure, easy-to-feed, flavourless, orange coloured, film coated granules. AbIver™ (Ivermectin) is a broad spectrum dewormer of easy-to-measure, easy-to-feed, flavourless, aqua coloured, film coated granules. AbButazone™ (Phenylbutazone) is a non-steroidal, analgesic agent with anti-inflammatory (NSAIDs) and antipyretic activity, in easy-to-measure, easy-to-feed, flavourless, bright orange, film coated granules.